WB Reid has been playing all kinds of music with all kinds of folks throughout the West Coast and points East for over 35 years. 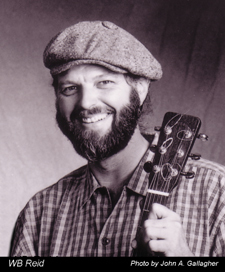 He is known as a fine singer, guitarist, fiddler, and also for his work on banjo-guitar and banjo-mandolin. He has also taught music in a variety of settings from individual lessons to major workshops throughout most of his career and continues to do so. WB's music crosses many boundaries and he's been sought after by top groups in several traditions and across several generations. He's played for many years with Seattle's premier traditional New England contra dance band, The Rhythm Rollers which includes the great New England piano player Bob McQuillen whenever he's in town. For the past year, WB's been the fiddler with the hottest young old-time band, The Tallboys, whose members are roughly the same age as his children. Just prior to that, WB was the principal accompanist for the legendary Alabama fiddler Lee Stripling until his death in 2009. He also plays regularly with a fine jug band, The Todalo Shakers, with his pals Eric and Suzy Thompson and Frannie Leopold, and less frequently with The Carolina Jug Stompers which includes original Holy Modal Rounder Luke Faust. Every year at Fiddle Tunes, WB finds himself in demand as an accompanist for faculty members in musical styles ranging from old-time to Mexican to celtic to New England, including backing up Tom Paley, Laura Risk, Jose Moreno, Mac Benford, Lee Stripling, Bob McQuillen, the Canote Brothers, and many more. At other events he's accompanied Debby McClatchy, Phil & Vivian Williams, Alan Jabbour, Mark Graham, Mark Rubin, and many others. He's made many CDs of his own with his wife, Bonnie Zahnow, and with the Canote Brothers and Mark Rubin, and with several other bands (see the CD page). In addition, he's assisted on recordings by Cathie Whitesides, Debby McClatchy, Pharis and Jason Romero, and others. WB Reid & Bonnie Zahnow -- plenty about this duo of WB & his wife here on this website. The Tallboys -- When the Tallboys original fiddler, Joe Fulton, moved to Indiana in September, 2009, WB was asked to take the fiddle chair in this hot young square dance and old-time band. He's pretty thrilled to be "the old guy" in what has become the gigging-est old time band holding down the old-time revival here in Seattle. The Tallboys play for a wild square dance on 2nd and 4th Mondays at the Tractor Tavern in Ballard, and numerous other events throughout the year. Lee Stripling (1921 - 2009) -- Our dear friend Lee Stripling passed away in April of 2009 at the age of 87 after a brief fight with cancer. We played a gig with him two weeks before he died, and a few tunes with him in the hospital a couple of days before he left. We miss him, but cherish the time we had together. WB & Lee started playing together soon after they met around 1998. Lee is the son of the famous Alabama fiddler Charlie Stripling of the duo "The Stripling Brothers," and he moved to Seattle just after WWII, and soon after quit playing the fiddle much. Since hooking up with WB, Lee has been out making the scene in full force, and in 2006 celebrated his 85th birthday by playing a contra dance. Lee & WB perform as a duo, and as "The Lee Stripling Trio" (with Bonnie, doing western swing trios and twin fiddling), and as "Lee Stripling and His Six Footed Boys" (with Tony Mates and Glenn Dudley, specializing in playing Lee's dad's tunes for contra and square dances). The Rhythm Rollers -- Several years ago WB was beside himself with joy at being asked to accompany his old friends Cathie Whitesides and Laurie Andres at a contra dance, and over the years he eventually has become a Rhythm Roller full time. We play lots of dances, and every once in a while get to play with the great New England pianist Bob McQuillen (and then WB gets to cut loose on banjo-guitar), another long-term Rhythm Roller. The trio also moonlights as Armonikos playing Greek and nearby music. The Todalo Shakers -- This is the acclaimed jugband with Eric & Suzy Thompson, Frannie Leopold, and a variety of folks on bass (our first and preferred bowed bassist is Steven Strauss). For Old Times Sake is now in its 3rd decade. Husband and wife Jim Mueller and Amber Roullard Mueller play closely matched twin fiddle, backed up by the locked in rhythm section of WB Reid on guitar and Jerry Ray Weinert on bass. We specialize in playing for contra and square dances but also put on a fine concert. The Carolina Jug Stompers -- WB teamed up with his old pal Ron Cole, along with Randy Johnson and Luke Faust (once a Holy Modal Rounder) in 2005 to record a highly praised CD of jugband, blues, and rags on the Old98 record label. The Bing Bang Boys -- Mark Rubin, bassist/tuba-ist extroadinaire from Austin, instigated this band with WB and Greg & Jere Canote after a week of fine jamming at the Festival of American Fiddle Tunes a few years ago, and produced a fine CD of rags and songs featuring fiddle, banjos of all sizes and types, bass and tuba (but no wood-topped guitars).